Pathologic thrombosis can occur through a variety of mechanisms, including excess clot formation, insufficient or inhibited fibrinolysis, or a combination of both. 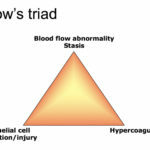 The three main triggers for thrombosis are described by Virchow’s triangle, which lists abnormal blood flow (usually stasis versus turbulence), endothelial dysfunction or injury, and hypercoagulability, although these mechanisms clearly overlap and may occur in concert. The constituents of thrombi differ depending on the triggering stimulus (inflammation versus endothelial disruption with localized trauma, stasis versus hypercoagulability, degree of endothelial injury with exposure of procoagulant substances), the location of the vascular bed (with tissue- and endothelial-specific expression of pro- and anticoagulant molecules, e.g. brain is rich in procoagulant tissue factor and phospholipids ), shear rate in the affected vessel (far lower in the venous versus the arterial system, except for the pulmonary arterial supply, which has relatively lower shear than other major arteries), and influence of other cells, including red and white blood cells, tumor cells and platelets. There are also differences in the appearance of clots that form in high shear arterioles and lower shear venules. Arterial thrombi consist largely of platelets with fibrin, that enmeshes as the thrombus grows. In humans, the primary cause of arterial thrombosis is atherosclerosis (thought to be due to rupture of the plaque with exposure of thrombogenic substances, such as tissue factor, with rapid platelet activation). Venous thrombi that form under low shear conditions consist largely of fibrin and entrapped erythrocytes, often in alternating layers. The composition of the clot, to some extent, may dictate the type of therapy used to prevent or limit clot formation. Since arterial thrombi contain many platelets, antiplatelet drugs, such as aspirin and clopidogrel, are useful. With venous thrombi, human patients are largely put on anticoagulant and not antiplatelet drugs, including direct acting oral anticoagulants (e.g. rivaroxaban, apixaban), warfarin or heparin, to prevent fibrin formation. In dogs, evidence-based evaluation of the literature (looking at specific diseases and their incidence of thrombosis and, conversely, disease associations in dogs with documented thrombosis), there is good evidence to support immune-mediated hemolytic anemia (IMHA) and protein-losing nephropathy (PLN) as underlying diseases associated with thrombosis (deLaforcade et al 2019) and clinicians should consider thromboprophylaxis in animals with these conditions (Blais et al 2019). In both conditions, thrombosis primarily manifested in the pulmonary vasculature, with aortic thrombosis documented in dogs with PLN. For prevention, suggested recommendations are to use antiplatelet drugs and/or anticoagulants in dogs with venous thromboembolism and anticoagulants (such as heparin-based drugs or direct acting oral anticoagulants) with or without platelet inhibitors in dogs with arterial or pulmonary thromboembolism (Blais et al 2019, Goggs et al 2019). However, more studies are needed to determine optimal drug regimes in particular diseases, because there is little evidence documenting the efficacy of anticoagulant or antiplatelet therapy in dogs for any prothrombotic condition. There was insufficient evidence in the literature to support an association of thrombosis with other diseases as single entities, including pancreatitis, sepsis, cancer, or hyperadrenocorticism, or therapy with corticosteroids (linked to portal thrombosis), but further studies in these conditions are indicated and the difficulty in accurately documenting thrombosis in dogs antemortem will continue to limit our recognition of disease associations. The authors did contend that dogs with more than one disease are likely at a high risk of thrombosis (deLaforcade et al 2019). In cats, there is strong evidence of aortic thromboembolism being secondary to cardiac disease, particularly hypertrophic cardiomyopathy (deLaforcade et al 2019). Clopidogrel is the recommended drug for thromboprophylaxis in cats with cardiac disease (Blais et al 2019, Goggs et al 2019). The latter publication also provides recommended dose rates for various drugs. Thrombosis is well-documented in dogs with this disorder and is associated with mortality in multiple studies (deLaforcade et al 2019). The mechanisms of thrombosis are not known but likely are multifactorial including activation of coagulation from histones or DNA released with neutrophil extracellular traps, increased tissue factor expression by monocytes, and release of damage-associated molecular patterns (e.g. cytokines, nuclear material) with tissue injury from anemia-associated hypoxia. Dogs with IMHA have laboratory evidence of disseminated intravascular coagulation and hypo-, normo- and hypercoagulable profiles with viscoelastic-based testing. As for IMHA, thrombosis is well-documented in this disorder in dogs (deLaforcade et al 2019). The thrombosis has largely been attributed to loss of the inhibitor, antithrombin, with albumin (they both are small proteins), however a viscoelastic-based study in 15 dogs showed no correlation between hypercoagulable profiles with non-activated TEG (all dogs were hypercoagulable) and AT activity (not all were low in these dogs) (Goodwin et al 2011).